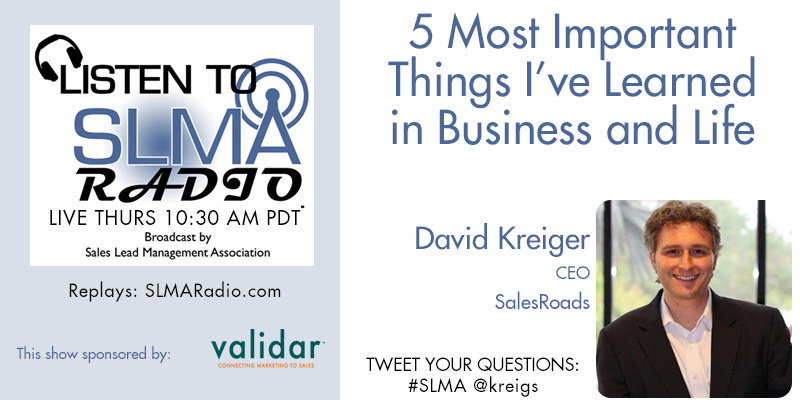 In this interview with SalesRoads CEO Dave Kreiger, he discusses his career, and the five most important things he has learned about managing and growing this business. Dave reveals his personal struggles to become the best manager in a very competitive business. David shares how he came to believe in five essential ways of acting and doing business which has served him so well. Some describe Dave as a salesman’s salesman, but this introvert by nature found ways to excel in sales by using some interesting approaches with people. The host in Jim Obermayer. David Kreiger is the Founder and President of SalesRoads, a business-to-business appointment setting, lead generation and sales outsourcing company. He has been named as one of The Most Influential Leaders in Sales & Lead Management by the SLMA the last four years in a row. David is consulted by some of the largest and fastest growing companies to help their organizations accelerate their sales through proactive teleprospecting.